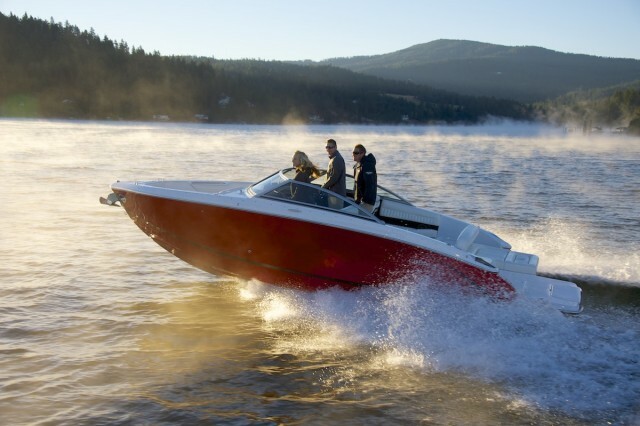 The new Cobalt R7 takes runabouts to a whole new level. 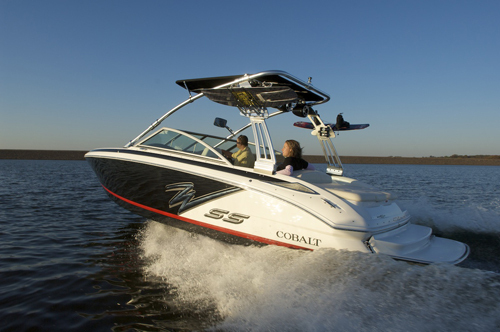 Recently Cobalt Boats rolled out the Cobalt R5, and now for 2014, the Cobalt R7 makes its debut. As you might have guessed from the headline, it’s, well... righteous. 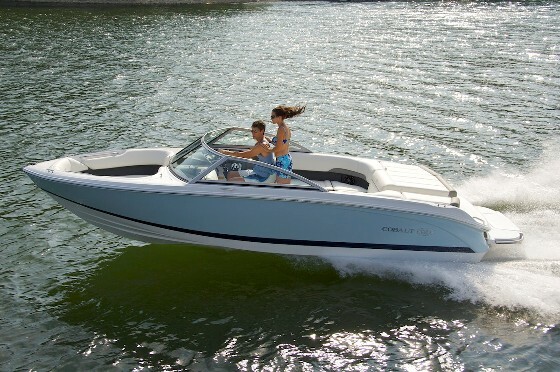 Cobalt has had no shortage of new models these past few years. The R7 is the latest. Like the R5, the R7 eschews the current trend toward pickle-fork or wide bow designs and offers up plenty of room with a traditional bow. 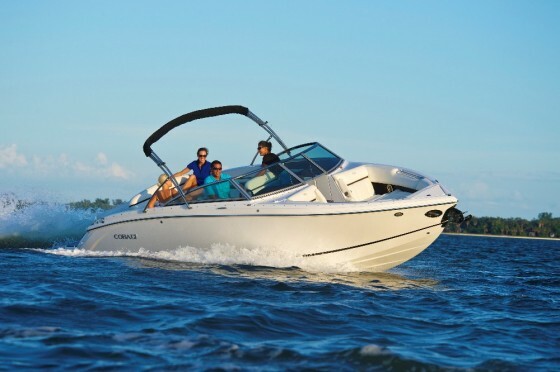 Cobalt accomplishes that by keeping the bow area as wide as possible as far forward as possible, and by using the narrow space at the very front of the boat for an anchor locker. That keeps the forward-most bolster nice and wide, too. The bow area also feels plenty spacious due to its seating arrangement. 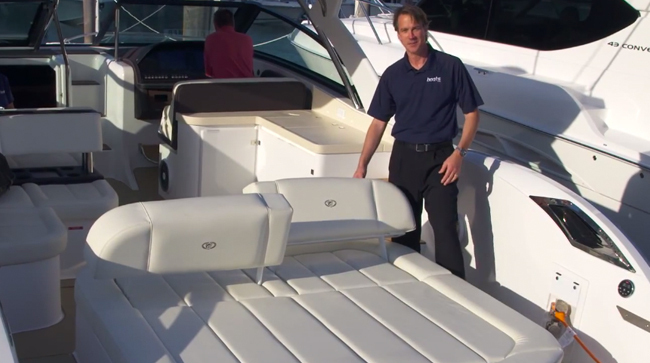 To the starboard side Cobalt uses a little jump seat, with a filler cushion that converts it to a lounge. 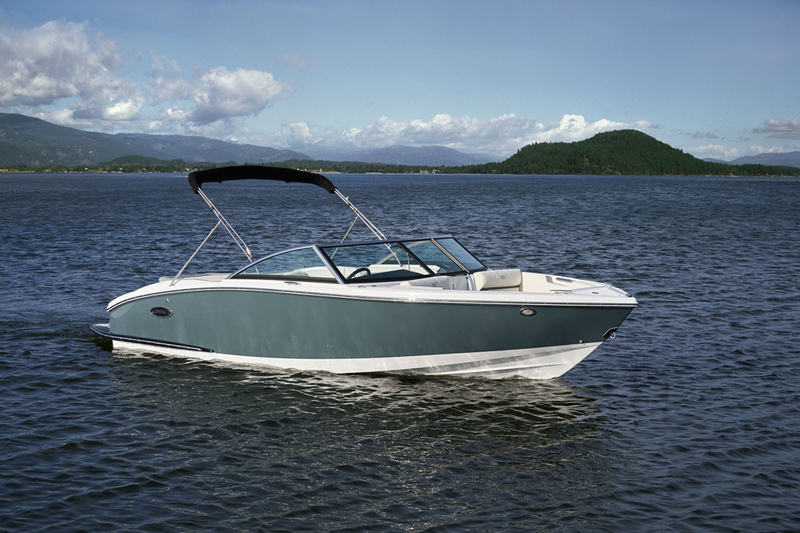 However, the seat offers bow passengers a place where they can enjoy the breeze and the best view yet still keep their feet on the deck. For those who prefer to lie in repose, they can sit to starboard where there’s a traditional bow lounge. Both seats feature gently angled back rests for exceptional ergonomics, and folding armrests. And because it’s a Cobalt, those armrests are through-bolted in place. 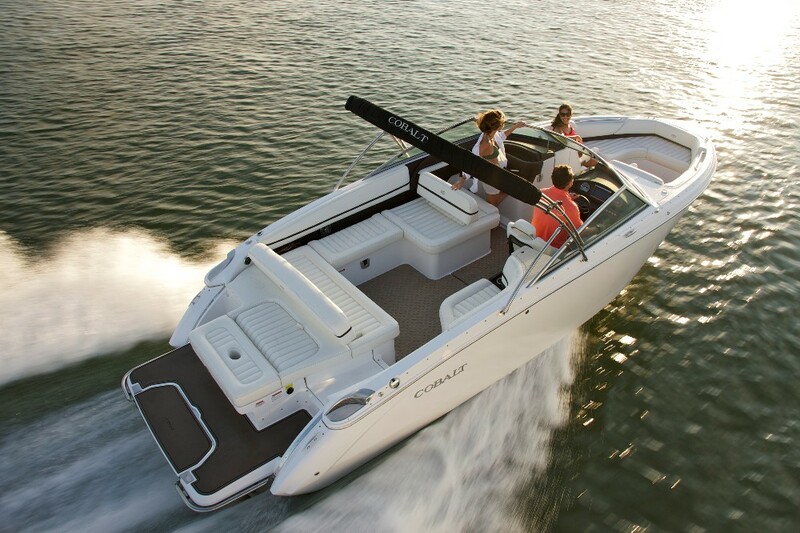 The blade-style windshield Cobalt chose for the R7 not only looks good, it boosts cockpit space. 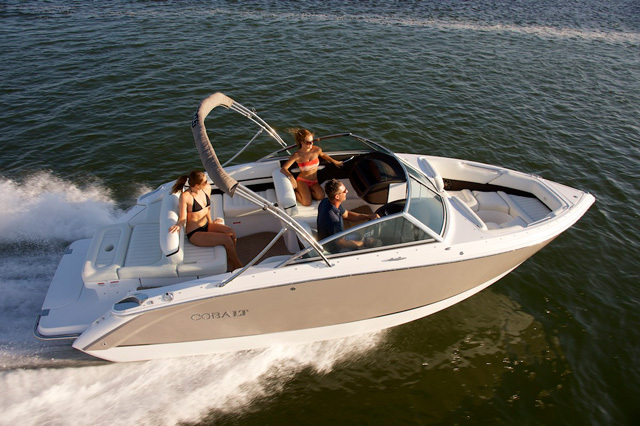 In the cockpit, Cobalt’s blade-style windshield is key to the spaciousness of the interior—not that the cockpit needs any help. Its design creates less of an intrusion into the interior space than traditional wraparound glass. 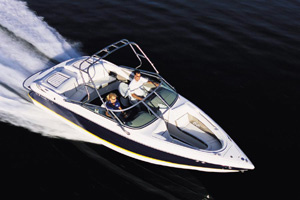 That, in turn, creates 95 inches of interior beam space in boat with 102 inches of overall beam. That spaciousness opens up all aspects of the cockpit. The observer seat, which is wide enough for two adults, features a backrest that flips forward to create a rear-facing lounge. It’s also wide enough for two, but only one of the passengers can put his or her feet up. The rear bench backrest has the same design cue, with a folding backrest for facing forward or aft. When facing aft, the sunpad is wide enough for two and looks over a swim platform covered with Sof-Track mat. Cobalt designers reimagined the swim platform with its innovative swim step, which functions much the same way a “swim out” does on an in-ground swimming pool. The swim step swings up, out, and down to create a comfortable underwater platform. Standard power is a 320-horsepower Volvo Penta 5.7-liter V8 with a DuoProp drive. With base power and the dual-propeller drive, the R7 planes easily and is a snap to maneuver around the docks. Base MSRP for the R7 is $115,850. For more information, visit Cobalt Boats. Cobalt 232WSS. Watersports Cool. Runabout Handy.